Today, Americans celebrate Thanksgiving by gathering together to eat a turkey-centred dinner. But it’s the trimmings served around the turkey that reflect America more than the bird itself. Growing up in suburban New York, my Italian-American neighbours accompanied the fowl with pasta, tomato sauce and garlic bread while the German-Americans served dumplings and sauerkraut. In my Irish household – we were just off the boat – it was parsnips, potatoes and Brussels sprouts. Of course we always finished with the Christmas pudding sent in the post from Ireland. Most American families come from somewhere else… mainly Europe, Asia, South or Central America or Africa. In my primary-school classroom, I was the strange one with a single nationality. Despite my American birth, I was the “Irish” girl whose parents talked funny. The other kids were proud of being an eighth of this, or a half of that and a pinch of everything else. That’s why Thanksgiving is the most American of holidays; it’s the one we all celebrate despite our religion, colour or place of birth. In New York, the build-up to the holiday is wonderful. Doors and porches may be decorated with six-foot-high cornstalks accompanied by plaid and denim-wearing scarecrows and a bunch of wild corn cobs to reflect autumn’s varied colours. The pinnacle is the Thanksgiving Day parade on TV. The lucky few might get there very early in the morning to watch the massive balloon floats being inflated and the marching band members shivering in the early morning light. Later, most Americans – regardless of their heritage – will watch football and eat themselves into a contented stupor. Coming to America meant a great deal to my family, as it has for the countless millions who’ve fled political, social or economic upheaval. My grandmother never forgot the woman who lives at the tip of Manhattan who so warmly welcomed her in 1923. Refugees founded the United States. The Pilgrims who began the first American colony in Plymouth, Massachusetts, were fleeing religious persecution in England. These Puritan separatists arrived in 1620 on the Mayflower after a long and difficult journey. Their first year was a harsh one but, in 1621, they were blessed with an abundant autumn harvest. 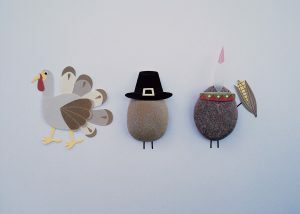 The first Thanksgiving Day (although it was not called that until 1841) was most likely celebrated in the autumn 1621, according to research by National Geographic magazine. One of the colony’s leaders Edward Winslow wrote the details in a letter to a friend in England, which is now held at the Pilgrim Hall Museum in Plymouth, Massachusetts. Their first efforts to plant crops had not gone well but the Native Americans who lived locally had shown the colonists how to fertilise the ground using fish and this yielded more than 20 acres of beans, peas, corn, squash and barley, according to Nathaniel Philbrick, author of Mayflower: A Story of Courage, Community, and War. In the wild, there was an ample supply of fish, lobsters, eels, mussels, wild turkeys, venison, strawberries, gooseberries, raspberries and three types of plums for the taking. There were 53 colonists present for the celebration – men, women and children. This 1621 story, told from the colonists’ point of view only, is what most Americans know about Thanksgiving. Thanksgiving is still a big deal in our house, even though I moved to Ireland 21 years ago. In Dublin, my Irish husband, kids and I invite our closest friends and ply them with food and drink. As they say in New York, “food is love”. Every year, we celebrate America’s diversity by choosing a different nationality from the nation’s melting pot. This year, it’s a Middle Eastern-themed Thanksgiving. We’ll be giving thanks for living in Ireland and for our great friends and colleagues here, while eating Syrian bread, Lebanese spiced turkey and Persian inspired sweets. The bread and dips are being made by the staff at Our Table, a cafe run in the Project Arts centre by refugees to Ireland who have just come out of the inhumane Direct Provision system. The group believes that food, making it, cooking it and sharing it, is a great way of breaking down barriers. When you break bread together, you can share your stories and realise that we’re all basically the same. Diversity is a bounty that should be harvested. When we celebrate our differences instead of insisting that everyone thinks, looks and acts like us, life is a much richer and more interesting place. This Thanksgiving – at a time of great uncertainty and fear in the United States and Europe – it’s worth celebrating the people, from all over the world, who contributed to making America great from the start and to the ‘new’ Irish living here who are doing the same. Besides, all the different foods are very tasty. Happy Thanksgiving! Posted on November 24, 2016 by ClearInk Manager.